I recently took part in a book swap on the Book & Paper Arts Forum and yesterday received a wonderful package from Bookarat from Germany. The theme for the swap was My Town and while I knew that this book was coming from Germany, I had no idea of how Bookarat was going to interpret that. As I opened the parcel I first came to a big surprise - 3 pages of German scraps (see my earlier post to know how generous and kind a gift that was) - then the beautifully wrapped parcel with a hand painted card - and finally the book itself! 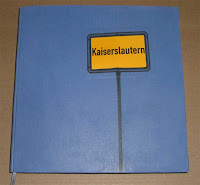 This is a very clever book, beautifully made and photographed, of signposts from the city of Kaiserlautern, with maps for endpapers, and an explanation in English of the names of the signs. I'm absolutely delighted with this book - thank you so much Bookarat. I received another book last week for my birthday from my dear friend Vi. In 2002 Vi & I went to the Marblers' Gathering at Arrowmont and while in the US we had three meetings with the bookbinder Dan Essig. I had been very interested in Dan's books for some time so was thrilled to be able to buy two examples of h is bindings. I bought the larger and the smaller of the three pictured and Vi bought the middle sized one. The large book is 5 x 3 x 2" [12.5 x 7.5 x 5.5 cm. 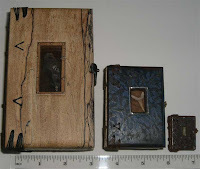 ], has wooden boards with a mica window in the front cover, containing an arrowhead. The binding on all these books is a 4th century Ethiopian coptic style which perfectly suits the materials Dan uses. The small book is 1.25 x 1 x .75" [3.5 x 2.5 x 1.75 cm.] and the mica window contains a tiny fossil shell. 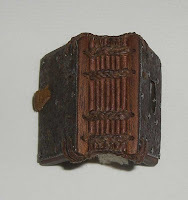 This little book (which looks quite large compared to th e tiny one) measures 3 x 2 x 1.5" [7.5 x 5.5 x 3 cm.] and has a fossilised shark's tooth behind the mica window. I have quite a collection of other binders' books (and now have added my lovely new German book to the shelves). I feel very fortunate to have 3 Dan Essig books and while I am a long way from achieving it, I think my aim is to someday make books that make me feel something of the satisfaction I get from handling Dan's books. BookGirl had some wonderful posts when she did a week of binding at BookWorks with Dan. I felt I was vicariously attending the classes through her blog. I have some tagging to do so that will be next post. Zowie, what a great gift! And indeed a generous friend. Dan's books are lovely, but even lovelier is the friendship you must have. What a lovely present - I am very envious! Hi Carol. I am thanking you for your comment via your lovely blog. I wish I had time to do bookbinding, having seen your beautiful work. I think you should use the silk papers in your books. I particularly like your 'banner' at the top of your blog. Very seductive! 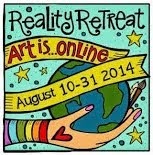 I just signed up for a weeklong class with Dan Essig in October. I took a day workshop from him in early May and was able to see many of his books firsthand. How lucky you are! And how lucky I am! Whee, I can't wait! I am amazed that you have three of his books. His work is amazing. I hope you will let me look at them one day. Oh Laurie, that is so great to be doing a week of classes with Dan. That's been on my "if only" list for years now. Please post about it, and let us know when it happens. Wendy, I find it a little unbelievable that I have them too. Of course you may see them - we'll have to organise that for July as I'm going to NZ for all of June. To do some bookbinding I hope. Love your beautiful books...and how generous was that of Vi to give you that middle-sized book! And your German book is lovely too...and all of the extra goodies! Wow: good for you! Too bad I didn't know you when you and Vi went to Arrowmont...you know, I'm just 'down the road' from there! You could have come for a visit. next time for sure!! Oh how lovely and what a dear friend. I hope to get to Meet Dan Essig one day and take a class form him also. I attended a class by Dolph Smith, one of Dan's mentors and friends, last summer and it was absolutely delightful. I am sorry for my misspellings. Apparently I am too tired to be doing this, but cannot sleep. I'm late, but my notifier has caved -in. What lovely books! And how generous of Vi (I know how generous of spirit she is! )in this gift. You say you are heading across the ditch so I'll catch up when you return. Have a lovely trip;take your thermal underwear and tell NZ to expect me.We're going home in Sept. Absolutely lovely to have met you, Carol, at such a wonderful setting as the Portage this weekend. And you're right, the photo around your blog title is beautiful. After I unpack and do the laundry, I must come back to your blog with a pot of Lady Gray. I'm really looking forward to learning about the different stitching, and looking at beautiful papers for therapy. Carol, I have just returned from my bookmaking class with Dolph Smith. He has hinted at a possible joint class with Dan in 2010. I can't say anymore about it at this time. I had a wonderful time in Dolph's class and have posted a photo of some of my work on my blog. If you have time to visit, please drop by. Hi,Carol. Your kind comment on my blog reminded me to check in with some of the book arts blogs I enjoy but that life has gotten a little too hectic to visit on a regular basis. Dan's books are truly a treat, aren't they? They're books, but also small pieces of sculpture. He recently did a "mica book" class here at Bookworks in Asheville, and although I didn't take the class, I saw some of the results, and they were wonderful. Unlike the mica book that we made in his Book-a-Day class, these had not only mica covers but pages made of mica as well. Stunning.